I recently received a call from a pet parent who wanted to enroll in my puppy preschool training class. This was great! I’m always happy to get a new dog started in class. So I gathered the information I needed to complete her registration. Both she and I were so disappointed when I had to tell her that at 16 weeks, her puppy was too old for the class. Her puppy was now a juvenile, beginning to become sexually mature and also becoming more reluctant to approach novel experiences with the same ease that occurs before this age. The news that socialization is best when a puppy is between 8 and 12 weeks, with 16 weeks as the final upper limit, is surprising to many pet parents. It is unfortunate this information is not more common knowledge. Of course, 16-week old puppies are still very young, look adorable and are very “puppyish” in their behavior. They will certainly benefit from a training class and continued socialization with friendly dogs and people. Yet, the best time for socialization is well defined in research. 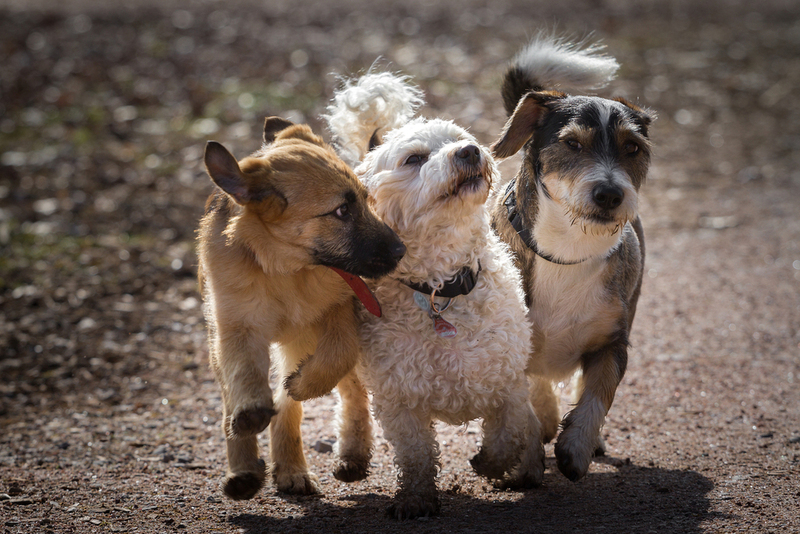 The American Veterinary Society of Animal Behavior Position Statement on Puppy Socialization is clear in its recommendation for providing safe socialization opportunities during the most critical period. Between 8 and 12 weeks is the best time to expose puppies to the great variety of sights, sounds, surfaces, people and other dogs they will encounter later in their lives. This is when they are the most open to new experiences and when they can most easily learn good social skills with other dogs. They do this by learning how to play with a variety of different dog breeds and dogs with different play styles. Puppies' willingness to explore slowly begins to decrease after 12 weeks. For this reason many puppy preschool classes, like our San Antonio Puppy Start Right Preschool, limits participation to puppies between the ages of 8 and 16 weeks. I am most dismayed when students tell me they have been discouraged from participating in puppy socialization classes when their puppy is younger than 16 weeks. Sometimes this recommendation is due to health concerns from their veterinarians or well-meaning friends. Occasionally, puppy parent students hear an outdated myth that puppies cannot learn before they are 6 months of age. Both of these cautions seem to be based in obsolete or invalid information. The recommendation to wait until a puppy is 6 months old before training is certainly a misunderstanding of how dogs learn. Puppies are learning a tremendous amount from the moment they enter the world. Those who research puppy development have found strong evidence puppies learn extensively about how to live in the world before they are 6 months of age. Precautions about health risks to puppies should certainly be considered. Puppies have not yet been fully vaccinated while they are participating in a puppy training class prior to 16 weeks. But research shows that these risks are low when a class is well run and the trainers are taking disease prevention measures. Results indicated that vaccinated puppies attending socialization classes were at no greater risk of CPV [parvo virus] infection than vaccinated puppies that did not attend those classes. It’s also helpful for pet parents to balance the risks of potential health concerns against the risk of behavioral concerns. Very young puppies who miss the critical socialization period are at risk of developing fears of common family life experiences, having limited friendships with other dogs, or developing a behavior problem requiring professional behavior modification. One of my own dogs had to be hospitalized during the critical socialization period. She missed the opportunity to explore many new environments during this time. She had debilitating fear of common neighborhood sights and sounds, such as leaves blowing across the sidewalk or cars passing on the road. She would flatten herself on the ground and not move. Although I was able to help her overcome these fears so she could enjoy a neighborhood walk, this took great effort. This situation most likely could have been avoided if she had been pleasantly exposed to these common occurrences during her critical socialization period. If she had rather been available for adoption at a shelter, she might have been difficult to place in a family that wasn’t prepared for a great deal of remedial training. After making sure a trainer is properly qualified to train you and your puppy (see the articles on the “Choosing a Trainer” page), find out what precautions the trainer takes to minimize health risks in her puppy training classes. Our San Antonio Puppy Start Right Preschool class is held at a facility that houses only mature, fully vaccinated, healthy dogs. The floors and play area are cleaned thoroughly before class and all toys are cleaned thoroughly between class sessions. Each puppy must be healthy to participate in class and must have received at least the first set of puppy shots before starting class. These precautions help ensure your puppy will have a great socialization experience with low risk of exposure to disease. Not everyone has the opportunity to take advantage of the sensitive socialization period in puppies. Dogs sometimes come into our lives when they are much older. But if you have a puppy coming into your life in the near future, plan ahead. Make sure you can enroll your puppy in a puppy training class during the critical socialization period. Learn how to make the best use of the latest research on how dogs learn to introduce your puppy to new experiences. Give your puppy the best chance to be a behaviorally healthy adult who will be your confident companion in your life’s adventures. Overall, K. (2013). Manual of Clinical Behavioral Medicine for Dogs and Cats. Elsevier Health Sciences. Stepita, M. E., Bain, M. J., & Kass, P. H. (2013). Frequency of CPV Infection in Vaccinated Puppies that Attended Puppy Socialization Classes. Journal of the American Animal Hospital Association, 49(2), 95-100.